Irish pop band Westlife have switched on the world-famous Oxford Street Christmas lights. This year's switch on marks the culmination of the Light Up London campaign, which let people sponsor their own bulb in the display for £5. The money will be donated to Breast Cancer Campaign, Great Ormond Street Children's Hospital and Centrepoint. This year's display promises to be the brightest ever with 260,000 bulbs - 10 times more than before. It includes illuminated gateways at Marble Arch and Tottenham Court Road along with large overhead displays, each spanning 30ft across the street, with a huge 3D chandelier the focal point of each centre. Westlife were joined by X-factor's Andy, Brenda, Nicholas and Chico in performing before light-up on Tuesday evening. 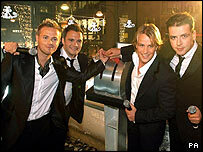 Westlife's Kian Egan said: "We never dreamed we'd be turning on the Oxford Street Christmas lights - it's a major honour." Last year's lights were turned on by Emma Watson, who plays Hermione Granger in the Harry Potter films. Earlier this month, singer Lee Ryan switched on the Regent Street Christmas lights.